Recently went through this whole process with some help from some of the other members here and a call to Mike B, and hiring a local hifi repair guy to do the solder work [no local amp guys and he did a fine job]. Here's a Red Stripe schematic I added IIC+ and Blue Stripe values to. 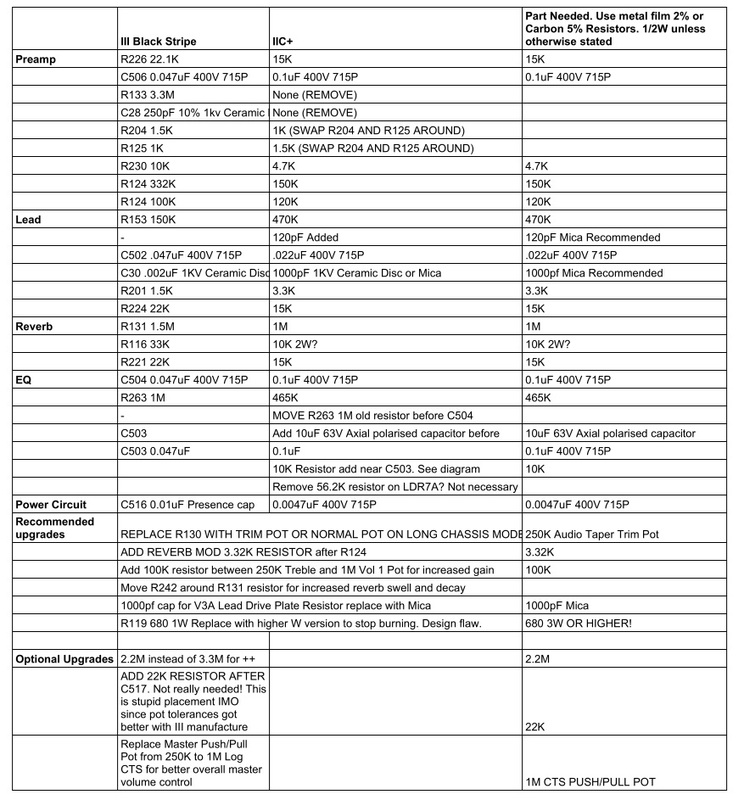 C26 is apparently something to do with the 5 band EQ, it isn't shown in any of these schematics. These two IIC+ schematics differ in some respects; C506 is at 100nf rather than 47nf on the second schematic. Also the resistor coming from the cathode of V2 is 1.5k rather than 1k in this. C203 is at 22uf in the pdf schematic but 15uf in the drawn schematic. The drawn schematic's values matched those of the Blue Stripe and from memory (which may be wrong) were the same on my Blue Stripe so I chose to leave them as they were. Everything else on my Mark III+ was replaced with the IIC+ values in metal film resistors from the first schematic I posted. This has smoothed the sound somewhat and changed the character of the gain, however as I said in the thread I posted yesterday, the amp still has the grainy character of the Mark III. As I said in that thread, keeping the pull shift disengaged gives a considerably closer sound to a IIC+. I can't see any component values in the pull shift circuit that differ between the III and the IIC+ however there must be a reason for this difference, I've heard it in other demos of Mike B-done Mark III+ amps, or I'd be tempted to put it down to my use of metal film rather than carbon film or carbon comp resistors. It may be that the component differences shown in the above IIC+ schematics are responsible, but I'm also sceptical about that. There may be other differences in the schematics that I'm not aware of, or it could be something to do with the R1 channel, or something else entirely. I've heard that pcb layout can affect the tone but I'd rather eliminate every other variable as that's not something that can be changed. Interestingly, when I've tried the Mark III mode on a Triaxis it has the same tonal character difference when compared to the IIC+ model. With the III+ mod this character is still there, although less pronounced. If this difference can be modelled on a Triaxis which definitely has a different pcb layout to a Mark IIC+ it stands to reason that it must be due to something else. I also heavily recommend recapping the filter caps, I haven't replaced the bias caps so I can't speak for how that would affect the tone but before they were replaced the harmonic content and sustain were limp and uninspiring. Much better now. You'll also want to get your head around some terminology if you're not familiar with cathode, grid, etc. There are some good guides online. I need to know what caps resistors or whatsoever needed to mod my mark III blue STRIPE to the III++. Basically nobody knows or is willing to give out that information at the moment. Sorry. Even modding a III to a III+ is hazy at best. Send it to Mike B for authentic modding. If it's gain you're after though the III Blue Stripe already has more than a III++. All I can tell you from what I've been told is that a III+ turns it into Red Stripe specs with some other minor additions/differences. Then the ++ adds some extra gain onto it. It still won't sound like a IIC+ or ++ though if that's what you're after but comes as close as possible. Why it can't be the same though is also a mystery! My friend has a III++ done by Mike B but he's reluctant to let me trace it. Until that happens or someone else traces one we won't know. I also don't want to take business away from Mesa if you live in the US but in Europe and elsewhere it's a lot harder to ship amps to Petaluma! Also the value of the amp may be harmed if you mod it unofficially. Just a word of warning. So if you're in the US ship it to Mesa. If elsewhere, mod at your own risk using the IIC+ schematics with the results lions has reported. the amp still has the grainy character of the Mark III. As I said in that thread, keeping the pull shift disengaged gives a considerably closer sound to a IIC+. I can't see any component values in the pull shift circuit that differ between the III and the IIC+ however there must be a reason for this difference, I've heard it in other demos of Mike B-done Mark III+ amps, or I'd be tempted to put it down to my use of metal film rather than carbon film or carbon comp resistors. It may be that the component differences shown in the above IIC+ schematics are responsible, but I'm also sceptical about that. I have purely metal film in my III Black Stripe preamp and don't get this issue as far as I'm aware. Sounds different to any other III I've played - a lot cleaner and brighter. There are also IIC+s that are metal film with no problems. I think it probably comes down to mine having the early transformers, but I cannot be sure. 1. The board layout for the different III stripes is the same. Some will have components added or removed or have different component values. 2. The ++ mod is VERY interesting history wise and is basically already incorporated into the III . More on that later. Most likely the second of these was used and incorporated into the III as R133 and C28, although their values ended up as 3.3M and 250pF in the III. Plus for some reason they go to ground before R105 and C47 instead of after?? However, a III+ is a III that's been modded to IIC+ specs as close as possible as Mike B. I don't think he does everything because of the amount of work involved. Just some stuff on the preamp and lead circuits I would imagine and the presence cap C516. Then either of the mods is done above to make it a III++. I imagine the first of these is done to a III, and this has already been done on a Blue Stripe hence why it has a lot more gain compared to other IIIs. See the schematics and compare this for details. It seems on the Green Stripe C26 is removed for some reason. You can check with the board layout to see if that's present on the blue stripe or not. The EQ section of the IIC+ is different as you'll see in the schematics. I'm in the process of doing a full III Black Stripe to IIC+ conversion (I'm going to leave R106 as 3.3M and do V2 of the ++ mod because I can then have a switchable ON/OFF ++ via the R2 channel, balanced by the R2 volume mod). I'm talking EVERYTHING I can. Just as an experiment (will probably put a lot of things back after unless I'm blown away). I'll let you know how it sounds. Last edited by jrb32 on Thu Apr 19, 2018 7:05 am, edited 1 time in total. Is this mod related to this one done by this guy? Ideally, you'd also want to change R153 to 475K and the unnamed ceramic disc off V3A from 500pf to 1000pf in the lead circuit. A…To quieten the amp, I changed all 4 of the big blue 220UF and 3 smaller darker blue 30UF capacitors. B…In location R-119, I changed the 680ohm 1 watt resistor to a 680 ohm 2 watt resistor as advised by Mike B. from Mesa. This was simply to handle the heat better. Yeah this is a factory recommended mod to stop you getting a hole burned in the pcb board! C…Changed C21 to 250pf and R243 to 220K. This is for the “quasi” C+ mod. D…Changed C50 to 1000pf and R212 to 100K. This is to make the amp more like the original tone of the no stripe/black stripe. Solid bottom, great mids and singing highs. As mentioned above. This is actually more to get it like a IIC+ in lead mode. The Black Stripe actually has a few other differences in the lead section. Anything more than that and you're looking at a load more work to get everything IIC+/++ spec. I know lions and charleonthronez did this and some more work though and still have some amp issues. I think this is down to a fault rather than a design but I could be wrong. This is especially with the Treble Shift pulled and it sounding really harsh and grainy. Until my III is back together I can't test this fully to see if I have something similar. We should all have basically the same PCB though so should affect ALL IIIs if it's a design thing rather than fault with that particular amp. 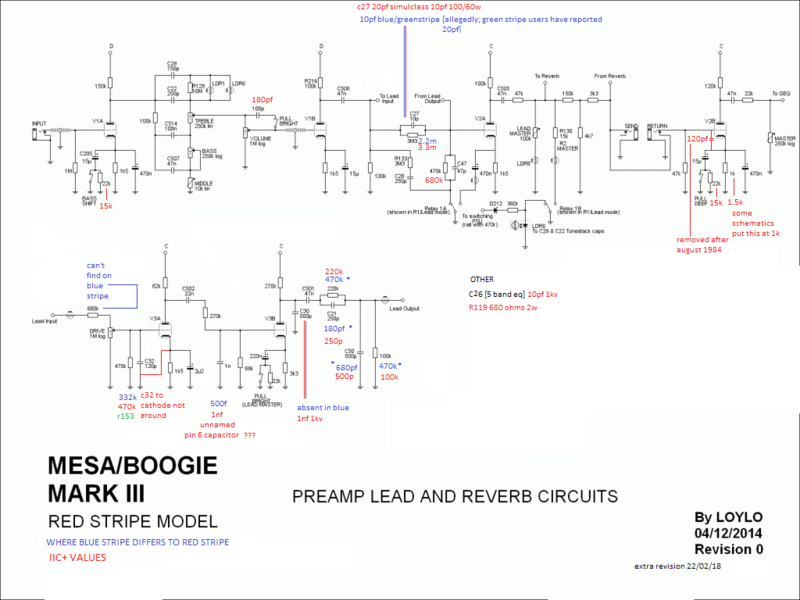 There's still that weird bit in loylo's Red Stripe schematic where LDR6 is connected to the Treble Shift AND R2 which is mega weird? Can anyone confirm this with their Red or later amp? Maybe there was a slight PCB revision. Last edited by jrb32 on Wed Jan 16, 2019 5:17 am, edited 1 time in total. Wow Jon!! Thx for taking the time to answer in so detailed way! Cheers! Well, I live in Athens Greece and should I decide to go with the mod, I need to order the parts mentioned from the mesa boogie and have my technician do the work! No problem! 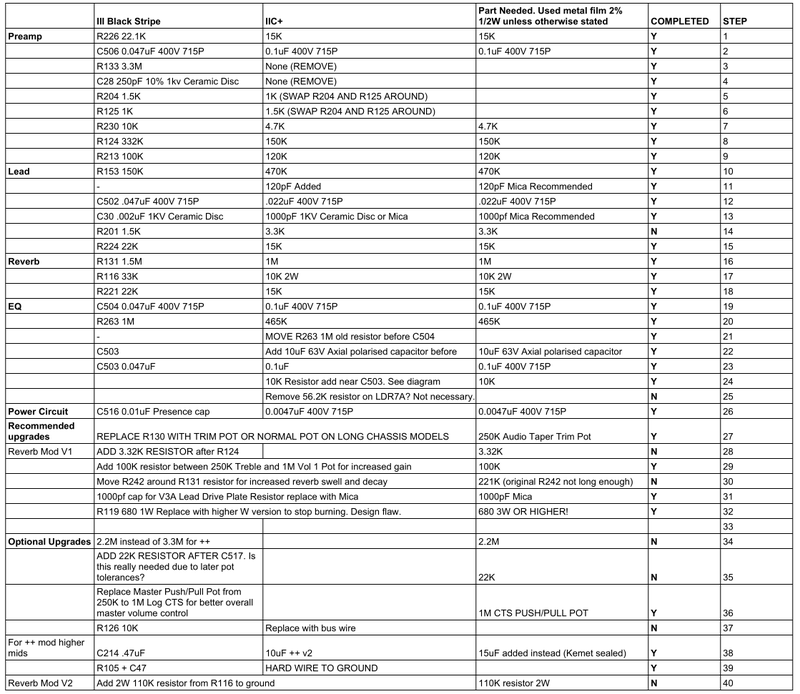 For reference this is the amount of work required for to do a full III to IIC+ conversion on a Black Stripe! I see why Mesa don't do this fully unless you specifically wanted it and paid a lot of money for the work. I might also permanently wire in R105 and C47 to ground and remove R126 to see what happens! Last edited by jrb32 on Wed Jan 16, 2019 5:18 am, edited 2 times in total. jrb32 wrote: No problem! For reference this is the amount of work required for to do a full III to IIC+ conversion on a Black Stripe! I see why Mesa don't offer this. I might also permanently wire in R105 and C47 to ground and remove R126 to see what happens! I don't think the grainyness is a fault. What it sounds like to me is the way it affects the voicing of the gain structure pre-distortion. Treble shift lets more low end/low mids through. When I have it activated I get great saturation but there's a low mid kind of sound that the IIC+ doesn't have and the III doesn't have with it not pulled. It translates as less tightness and attack. My III+ still needs a few component swaps in the preamp section, but the overall character is much nicer. It just gets a bit mushier on typical settings than a IIC+. Im hoping eliminating the III's weird R1 mode circuitry will alleviate this. If not I'll be lowering the C30 value to 500pf or removing it. But I'm hoping this is the product of some other components I haven't swapped out. Jon I've got a few questions about some parts I'll fire at you soon. I think r126 was one of them. No worries I'll answer best I can! R126 seems to be activated only on R2 mode. Not sure why this is done - I would imagine some kind of shaping of the R2 sound but seems unnecessary. Could probably just replace with bus wire instead. Any others fire away either on here or PM me. "I don't think the grainyness is a fault. What it sounds like to me is the way it affects the voicing of the gain structure pre-distortion. Treble shift lets more low end/low mids through. When I have it activated I get great saturation but there's a low mid kind of sound that the IIC+ doesn't have and the III doesn't have with it not pulled. It translates as less tightness and attack." Last edited by jrb32 on Fri May 04, 2018 10:20 am, edited 1 time in total. So I did the full III to IIC+ conversion and I AM ABSOLUTELY BLOWN AWAY!!! I have some pics up here. It's mega messy though as I had to lift all the components up originally to trace a schematic for it https://mega.nz/#F!HZAAgRLS!g1V-9NWuStE3uW2O7MKZKA but overall it wasn't that hard to do, just a lot of time. The EQ section was a little tricky to mod and involved bypassing one PCB trace but was pretty easy and everything else was just component value swaps. I'll try and get some sound clips up but need to borrow some mics. It was definitely worth it though 100%! Last edited by jrb32 on Wed Jan 16, 2019 5:19 am, edited 1 time in total.